Prime Minister Nguyen Xuan Phuc and his spouse, on October 21, wrapped up his working trip to attend the 12th Asia-Europe Meeting Summit (ASEM 12) and the Partnering for Green Growth and the Global Goals 2030 (P4G) Summit, as well as visits to Austria, Belgium and Denmark from October 14-21. During the week-long tour, the PM conducted nearly 70 multilateral and bilateral activities within the framework of the ASEM 12 and P4G Summit, held a working session with the European Commission and visited Austria, Belgium and Denmark. At the 12th ASEM in Belgium, the PM made a speech at a plenary session themed “Reinforcing the Multilateral System: Advancing the ASEM Partnership on Global Issues”. Attending the first P4G Summit in Denmark, the PM conveyed a strong message of the importance of strengthening global cooperation in achieving global green growth goals till 2030. Vietnam ranked 77th out of 140 economies worldwide in the Global Competitiveness Report 2018 which was released by the World Economic Forum (WEF) on October 17. 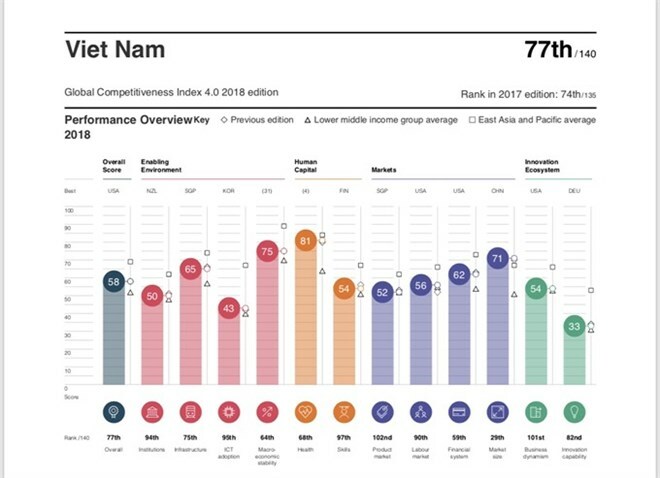 In this year's Global Competitiveness Index Vietnam dropped three places compared to the previous year at 74th out of 135 countries. However, Vietnam scored 58.1 points in the 2018 ranking, a slight increase compared to the previous year’s 57.9 points. Compared with other countries in the region, Vietnam was behind Singapore (2nd), Malaysia (25th), Thailand (38th), Indonesia (45th) and the Philippines (56th), but came ahead of Brunei (62nd), Cambodia (110th) and Laos (112th). The Central Institute for Economic Management (CIEM) has forecast Vietnam’s economy growth for 2018 may be at 6.88% thanks to positive socio-economic results in the first nine months of this year. The forecast is higher than the institute’s prediction of 6.71% released three months ago. For the whole year, export growth is also forecast at 13.34%, trade surplus at US$5.1 billion, and average inflation at 3.97%. The bank is tasked with collecting, preserving, storing, and supplying tissues for medical and research establishments, as well as partnering with foreign individuals and organisations for health check-ups and treatment. On the occasion, the hospital also inaugurated a modern health check-up area. "Hoang Hoa su trinh do” (The Envoy’s Journey to China - literally translated as maps and itinerary of the envoy’s journey to China), of the Nguyen Huy family in the central province of Ha Tinh, is an ancient book describing one of the diplomatic activities between Vietnam and China in the 18th century. It features the sending of Vietnamese envoys to China, showing exchanges between the countries in the Asia-Pacific region. 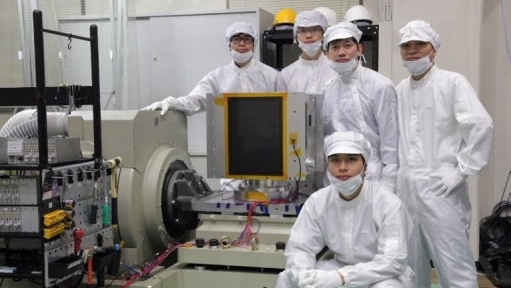 MicroDragon, a miniaturised satellite developed by Vietnamese engineers, is scheduled to be launched into space in December this year with the assistance of Japan, announced the Vietnam National Space Centre (VNSC) on October 18. The project has helped establish a disaster warning, resources management and environmental monitoring system by developing the infrastructure of the VNSC and transferring satellite manufacturing technology. 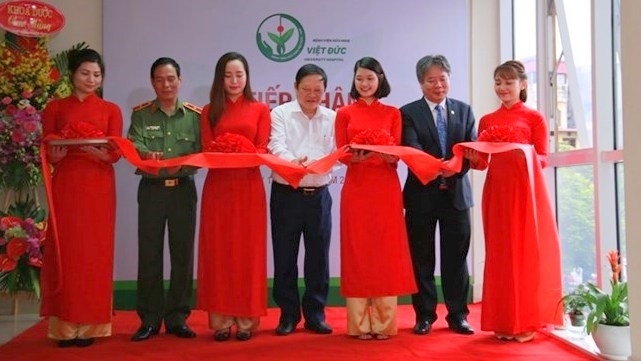 Under the project, 36 Vietnamese engineers also completed a satellite programme and succeeded in the manufacture of the 50-kilogramme MicroDragon satellite funded by official development assistance. The third Youth Olympic Games (YOG) officially wrapped up in Buenos Aires, Argentina, on October 18, after 12 days of competition, with the Vietnamese contingent having surpassed the goal of winning at least one gold medal set prior to their departure. With only 13 athletes competing in seven sporting events, Vietnam enjoyed its most successful YOG ever, claiming a total of two gold and one silver medal and standing in 26th place overall among more than 200 participating countries and territories. The 2018 YOG took place in Buenos Aires from October 6 to 18, featuring over 4,000 competitors aged between 14-18 from 206 countries and territories worldwide. The Cau Vang (Golden Bridge) has been honoured among the Top 5 special awards of the year under the Guide Awards 2018. 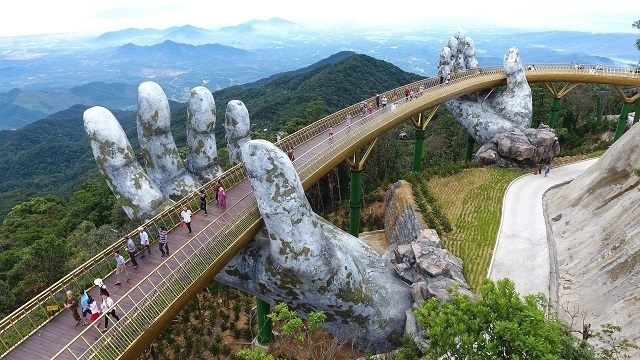 With an impressive design resembling a yellow ribbon on the hands of a god, at a height of 1,400m on Ba Na peak, the Golden Bridge has been praised by prestigious news agencies, newspapers and social networks as one of the world's most spectacular walking bridges.